I am waiting, I was going to say patiently. Except that would hardly be right, because anticipation is in the air within these walls, it has been slowly building since I first ever read of the concept many months ago. My appetite for new knowledge has caused a hunger that is now soon to be sated. 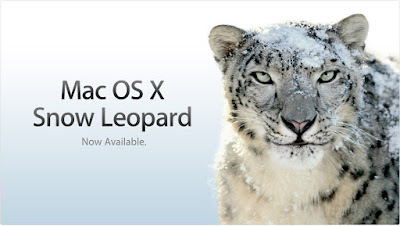 I am speaking of SNOW LEOPARD of course Apples' new operating system. It will be delivered and installed in a few days time - hurrah! I do recall in the early 80's of having our first computer, a keyboard and a monitor and of having to type in the programs by hand, all copied from a book. Woe to him or her who mistyped and had to start all over again. Will development ever cease? Now that's a naive question, for I believe that computers have far to go and that they will make even greater inroads into our lives. Imagine if the transport system in every country was ruled by a system that would control our personal transport carrier. Enter the vehicle, speak in where you needed to be, take a seat and off you go at a speed that would be regulated by the amount of users and gauged to arrive safely at a destination. You want build a new house? Select the location's ordinates, the design and all would be done for you. Including materials ordered and delivered to the site. Equipment all controlled by computer. Not so crazy actually, for a friend of mine several years ago designed a machine that could built brick or concrete block walls. The machine failed though and the problem was with the users who failed to clean it properly! Much the same for anything we want whether that be a Ship, Aircraft or Needle. There is no end as to how computer controlled equipment could bring us benefits. I have never been a great fan of August, once past the Lughnasadh festival, I could stay in bed snoozing till September comes around. The dictionary definition for august describes it as 'imposing and majestic'. Yes, imposing it is, I can agree with that one. As for majestic absolutely most definitely not ! It is the month of the dogs and the dog bites. I remember, as a youth delivering newspapers up and down the hills of a small market town and of leaving loads of leather gloves between the jaws of ferocious snappy small pets; better that than fingers. I'll give you another example of August: This morning I rang a friend around 10 o'clock and listened at first to empty silence as the call was picked up. I heard a hoarse rasping and growling sound, which I identified as a Jack Russell with laryngitis. My immediate thought was that I had misdialled through to the Animal Dispensary for Sick Creatures ! I was just about to apologise, when there came the muffled faintly recognisable voice of Ms Q, to whom I now offer my abject apologies for having imposed upon her Sunday morning slumbers. This then is an example of the first definition of August. In the days of yore: My parents had a boat, a small wooden barge called the Rascal. It was their hide-away, a peaceful retreat from the blitz of a raging war. They were fortunate not to have had it commandeered into the war effort as happened to so many of Britain's small craft. 'You were afloat before you could walk' and she wasn't referring to me being in her womb. I have several memories of being onboard the Rascal. One of which is awakening from sleep and seeing the grey wooden floorboards floating near the base of my bunk. I think that it was probably the sound of the hand pump being used that woke me from sleep. I certainly wasn't frightened so perhaps it was a regular occurrence and another reason why the Rascal remained in private hands! You know, I never ever enquired as to how or from whom they obtained their fuel for the engine. Rationing in Britain did not end until 1950s., so where did it come from? My assumption is that it was a black-market arrangement that fuelled the single cylinder petrol/paraffin engine. Many years later when I was working in a small shipyard, I met a larger version of the Petter Engine, similar to that which was on our boat. Another childhood memory I have is of going through a long dark canal tunnel and of being kept in the galley (kitchen) area for my own safety. The engine had either stopped or perhaps my father switched it off to save fuel. 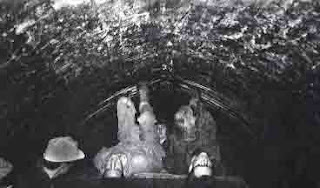 Anyway he and another were using the old Bargee method of Legging the boat through To do this they either had to lie on their backs on the cabin roof and put their feet on the roof of the tunnel and walk, or if it was a narrow tunnel they would do it one each side with their feet on the walls while my mother took the tiller and steered. I recall that she disliked going through the tunnels, in case they met a large barge towing a string of lighters coming the other way and the wash would tend to push Rascal on to the mud banks at the tunnels side walls. Mother didn't like mud or the slimy walls of the deep locks, her preference was to go ashore and assist the lock keepers to open or shut the lock gates. Of course in those days of rationing and shortages, there were certain pecuniary advantages to be gained by travelling the waterways, fields of cabbages, carrots and spuds etc.as well as setting the occasional snare for what might come along during the night! Today when reading about the narrow boat people for example Maffi's blog www.narrowboater.blogspot.com I see that they use the shops and Supermarkets for their supplies and a smile crosses my face. Of course things have changed, social conditions are very different; they have fresh water points, sewage disposal stations and every modern amenity. Gone are the carbide lamps that my father used, gone too are old families each having their own individual paint scheme, so to have the cap wearing pipe smoking grannies. There remains today only the canals, perhaps there is a similar camaraderie between all of the bargees I don't know ? The picture above shows a Rowan Tree/Mountain Ash in full fruit. It is said that the ancient Irish Druids would eat three of these berries to give them inspiration. I have eaten them several times and found them to be a bit sharp, then of course those people were well known for there caustic wit and shrewdness. Today is the old date of LUGHNASADH, by old I mean before the dates were revised by the calendar change. Many of today's Druids have longed recognised that the dates given by the 'official calendars' were wrong or out of sync; in fact the dates were set by the British Judiciary for their Assize Courts. So on taking a look at the solar festivals which are equally spaced throughout the year, realised that the Fire festivals need to be equally spaced too. 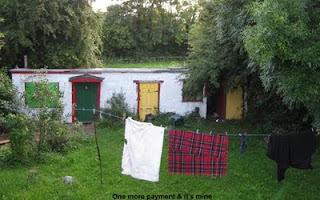 I often dreamed about living in a long narrow boat and of the comforts it would afford. The free fresh air and all that greeness to be seen, from every window. Of hearing the wind and rains lashing down on the cabin roof. This then is similar - just close your eyes and IMAGINE ! E - Essential to start your day : SILENCE ! P - Pet Peeve: Conniving Politicians and so called Experts! T - Tea : Roiboos, Green, Cammomile / Lemon with Ginger. X - Xmas : No, I'm a Pagan!